Pseudo Reality Prevails: Are trans people living in New Zealand more likely to be murdered? Are trans people living in New Zealand more likely to be murdered? The recent murder of Zena Campbell, a 21 year old trans identified male in Wellington, has led to a series of media articles which highlight the unique vulnerability of trans people to violence and murder. National Council of Women (NCWNZ) Gender Equal spokesperson Dr Gill Greer says “the murder is an example of the kind of transphobic violence directed towards trans people and particularly trans women.” [….] Speaking globally,she noted trans women in particular appeared to be a target of violence. "The Human Rights Commission highlighted some of these issues in a report back in 2008 but we've not made enough progress in the past 10 years," she said. Green MP Jan Logie echoed these ideas at a candlelight vigil for Zena Campbell, stating that “a lot more work needs to be done about violence towards New Zealand’s gender minorities.”. Trans women around the world are slaughtered weekly, just for being who they are. It’s scary. And it’s not our fault. I refuse to accept this. By the 30th of October this year, 24 trans women, most of them women of colour, had been killed in the US alone. Rates of violence against trans people are so offensively high that there is even a wikipedia page that records reported unlawful deaths of transgender people by year and location. There are 52 people currently listed on this page for 2017. Are these claims of unique vulnerability to violence, murder and other forms of assault true? In what follows I will restrict my attention to murder rates for transgender people. I will not attempt to discuss or question the various forms of oppression, discrimination and prejudice faced by transgender people which do not involve murder. In looking at this issue critically, it is not my intention to minimise or dismiss the various forms of harms done to transgender people by a variety of means. I think that murder of Zena Campbell was a reprehensible act against a vulnerable person, and ought to be condemned. The question is whether this death served the interests of a broader narrative around murder rates, and if the assumptions behind this narrative are true. As I will go on to note when I turn to look briefly at the case of Brazil, there are many solid reasons for thinking that murders of transgender people in regions of the world where there is widespread institutional corruption and lack of recognition of transgender people would be under-reported and frequently unrecognised. Given the social prominence of transgender activism in New Zealand over the past ten years, and the amount of coverage and institutional support surrounding the recent death of Zena Campbell, I strongly doubt that these concerns apply to the New Zealand context. I think it highly unlikely that a trans identified person other than the two documented instances (Richard Milton ‘Diksy’ Jones in 2009, and Zena Campbell in 2018) has been murdered in the past ten years. How does this compare to the national rate of murder for the country as a whole? New Zealand is a relatively safe country with a low homicide rate. Using police data from the period between 2007 and 2014, alongside census figures from 2006 and 2013 for overall population statistics, I worked out that New Zealand has a murder rate of 1.17 murders per 100,000 people each year. (Wikipedia quotes a rate of 0.91, apparently based on just the year 2014 – I believe my estimate for the period in question to be more accurate). Of course there are big sources of possible variation and error here because we are dealing with such small numbers, if we went to the trouble of calculating confidence intervals there would be fairly wide margins of error for all of these estimates. 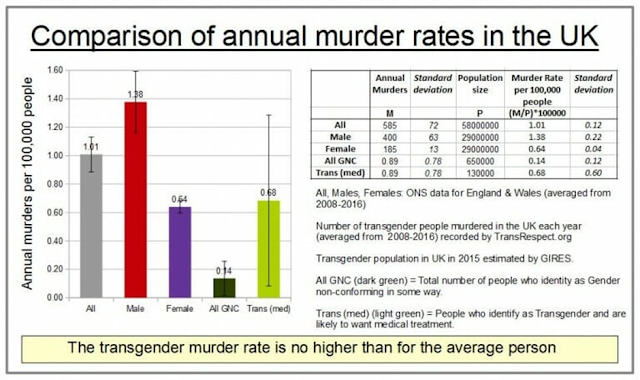 Having said that the empirical data of 2 trans murders over a ten year period fits in fairly well with the overall average murder rate. If the larger population estimates are true, the the trans murder rate appears significantly smaller than the overall rate. “Applying the FBI's 4.7 homicides per 100,000 means we'd expect to see ~38 trans murders a year if the rates were identical to that of the general population (4.7 * 8). That's three times as many trans deaths as were actually recorded in 2014. 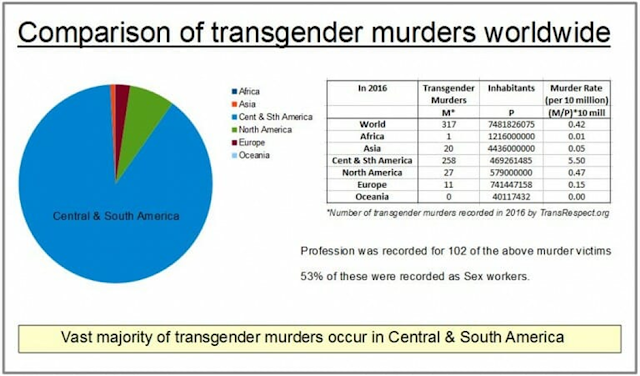 Keep in mind that if you use a higher trans prevalence rate, you'd expect even more murders. Doubling the prevalence rate from .3% to .6% means you'd expect there to be ~76 trans murders per year. If you adjust those numbers for race and gender it becomes obvious how some trans women are obviously at higher risk. Blacks and Hispanics are about 29% of the general population, and women are about half the US population, which means ~15% of the trans population should be TWOC - and those black and Hispanic trans women account for more than 90% of all trans murder victims. “For the database coordinator of this research, systems analyst Eduardo Michels of Rio de Janeiro, "the underreporting of these crimes is evident, indicating that those numbers represent only the tip of an iceberg of bloody violence, since our databank is based on articles published in newspapers and over the internet. Unfortunately, this type of information is seldom provided by the more than 300 active Brazilian LGBT nongovernmental organizations (NGOs). The real numbers of deaths of LGBT people in the country must certainly exceed the estimates herewith provided; this is especially true in more recent years since police officers and police inspectors have been increasingly and blatantly ruling out the possibility of homophobia being a factor in many of these killings of homosexuals." The hard part is estimating the size of the trans population. Failing to find any solid estimates online, I will use the 0.6% of total population figure from a recent US survey. Census data for the population of Brazil over the 2008 – 2017 period gives a rough and ready population estimate of 200 million. This lets us guess the number of Trans Brazilians as 1,200,000. The 26.74 means homicides per 100,000 people, taken from 2015 data. So the 26.74 per 100,000 is a conservative estimate. If we use these figures, the expected number of trans murders in one year in Brazil should be 26.74 * 12 = 320. That is using the conservative homicide rate. Using the TGEU data above, we get an average of 106 trans murders per year. This means that even if there were two unreported or unrecognised murders of trans people for every reported instance, the actual murder rate for trans people would be about the same as the rate for the population as a whole. There are stats on LGBT population as a whole for Brazil, which are probably a lot more reliable than my rough and ready estimate of the trans population. 20,000,000 LGBT people at a murder rate of 26.74 per 100,000 gives 200*26.74 = 5348 expected deaths. Again, this is using a conservative death rate estimate. In this case for the LGBT murders to equal the national average rate, there would have to be around four unreported or unrecognised murders for every recorded instance. Brazil is a country riven by corruption, violence and prejudice. So it is surely conceivable, even likely, that there is a such a vast iceberg of unreported LGBT / trans murders. But the available reported data just does not support the thesis that trans or LGBT people are more susceptible to homicide. The number of murdered trans people in Brazil is high because Brazil has a large population and an extremely high homicide rate. There may be hundreds of unreported cases, and it could be that transphobia is a motive in many of these killings. But the data as reported simply does not support this speculation.